One hazard of being an opinionated SOB is that I'll occasionally write something on here and it'll come back and bite me in the A$$. There is, of course, the odd forum member who seems to thrive on these kind of 'bottom of the 7Axx barrel' watches. No names. Me ? I've had enough of them in my time, so nowadays I tend to avoid them like the plague. I will however make exceptions sometimes - particularly when it comes to rarer non-Seiko branded 7A38's - especially Orient J39's. A few I've bought have been a bit rough-ish. But I probably could have done without this one, which I bought myself as something of a consolation prize last September. Rewind back to last August. Meanwhile, knowing my weakness for obscure non-Seiko branded 7A38's, Lawrence hadn't given up in his efforts to bankrupt me. 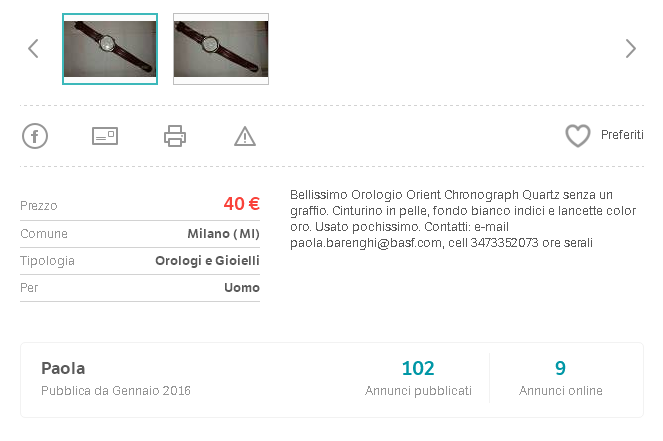 Late last Sunday evening, he PM'd me a link to yet another Racer J39 which had appeared on milanuncios.com earlier in the day. In fact, I'd already seen it myself; I found it while checking on the status of the three NOS Racer J39's that I was planning to buy. 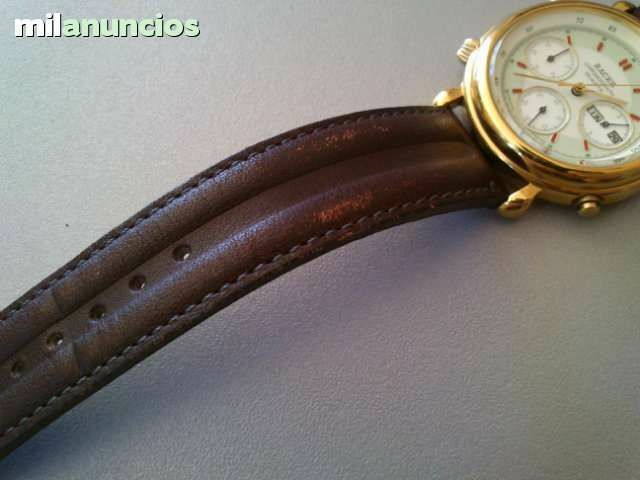 Reloj de caballero Racer Chronograph Quarz, con 3 esferas. 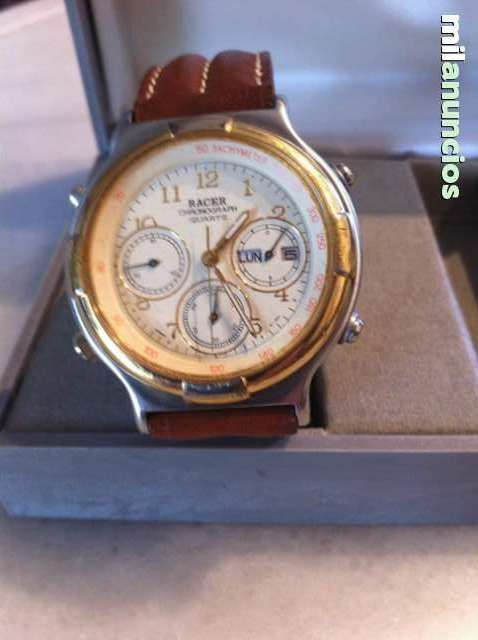 Armis de acero, correa de piel. Buen estado. Funciona correctamente. (Seller's photo rotated through 90 degrees). I will admit that I was tempted initially. It would be another different Racer J39 variant in 'my instant collection'. Perhaps if I hadn't just bought the other 3, NOS with tags for 100 Euros each (or less) I might have gone for it. It also occured to me that I was 'pushing my luck' with Julio's patience and good will, even though this seller is supposedly located in Barcelona. So I've just favourited it for now. However, I was curious to learn more about it. So I've messaged the seller (twice), asking her what the case-back model number is. I sent a couple more messages. The seller never did reply to any of them. After a couple of weeks, I relented and asked Julio to try contacting the seller vith a view to purchasing it on my behalf. 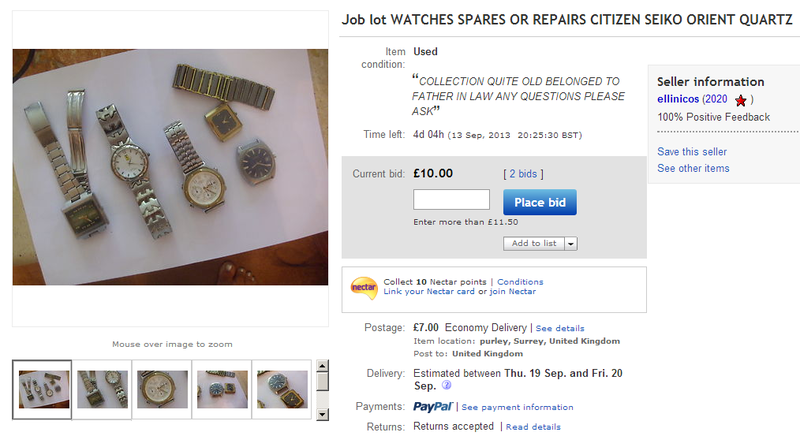 Hi Paul, unfortunately the watch has been sold. I’ve emailed the lady yesterday and texted her today because she was not replying. Annoyingly, the advert was tantalisingly left up on Milanuncious.com for a couple more weeks, before she finally got round to pulling it. 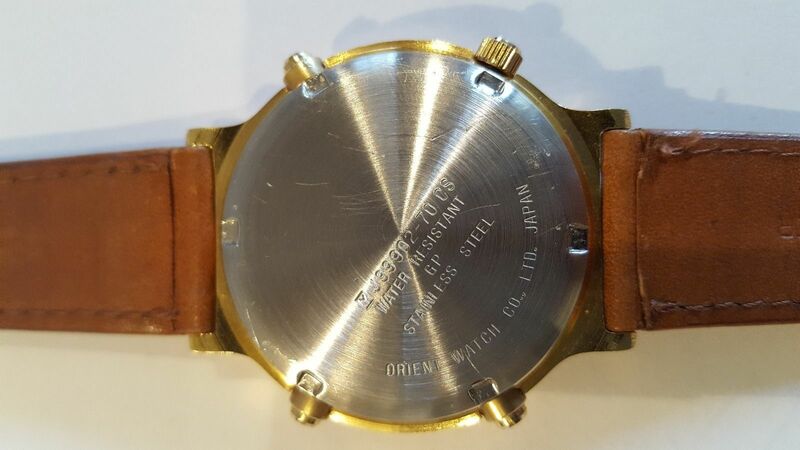 In the meantime, what appeared to be almost exactly the same watch, but the Orient branded version - a J39002-70, turned up on eBay UK in a junk job lot of watches, a matter of days later, in the second week of September. Initially, most of the seller's photos were just crops of the primary image, which included her painted toenails at the foot of the shot. I also tried to persuade her to split the J39002-70 out of the job lot and sell that to me separately, but she wasn't having any of it. 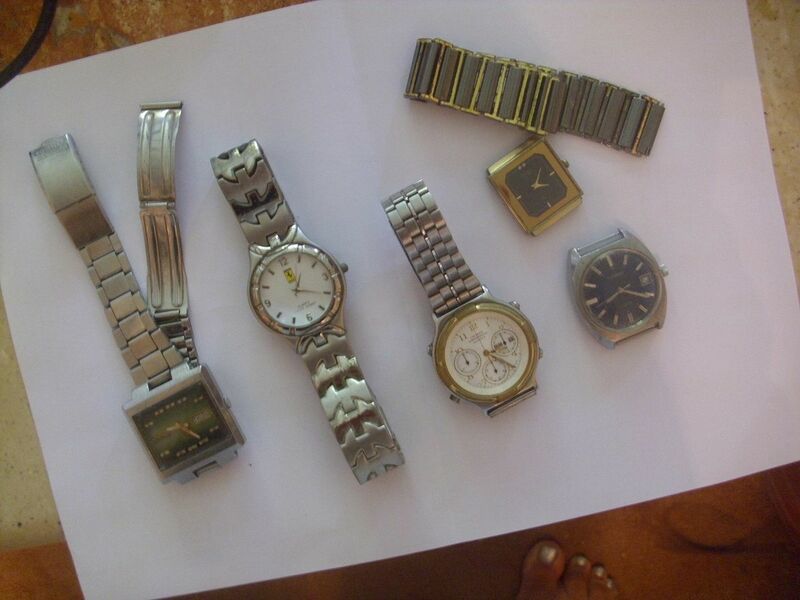 Most of the remainder of the lot was indeed junk - the 'Ferrari Quartz' watch and RADO bracelet being obvious fakes. 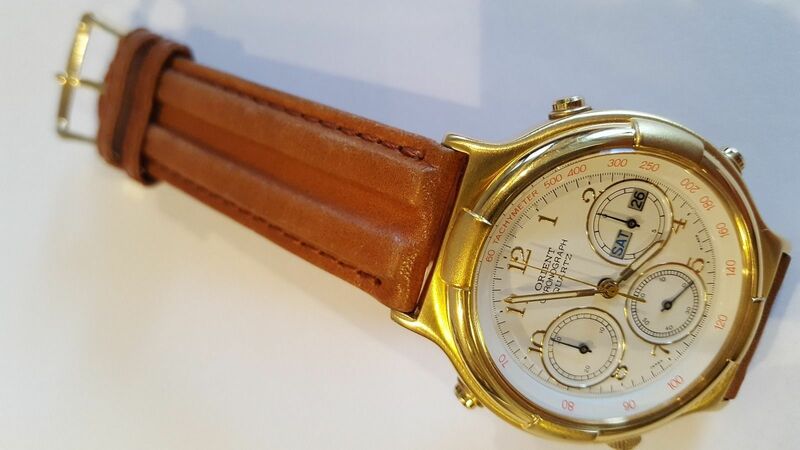 The only other thing worth having was the Seiko 6106-5530 '5' Actus which had attracted the attention of another collector who bid against me for that. I really don't know why I bothered bidding to win it. 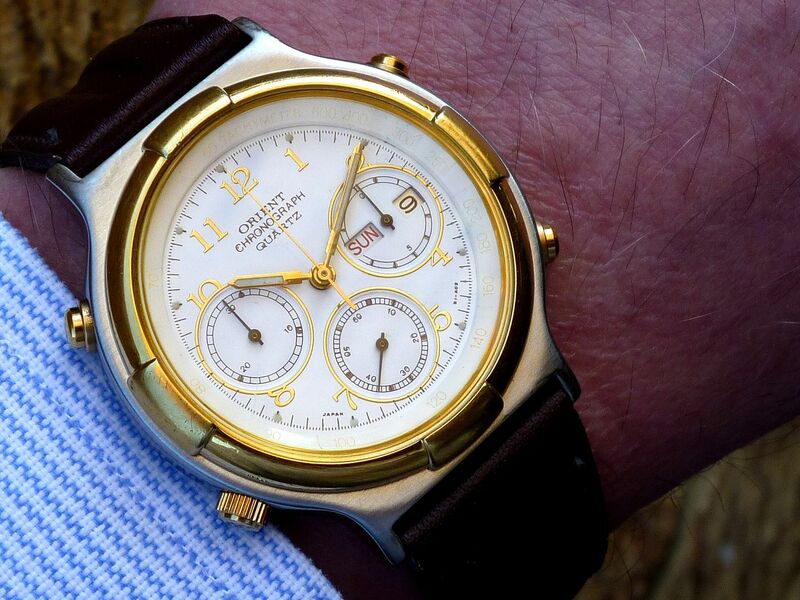 Like I say, getting this Orient J39002-70 (and the rest of the crap that came with it) was probably a psychological 'consolation prize' for having recently missed out on that equivalent Racer J39 on Milanuncios.com. Because it didn't have a single redeemable feature. It was absolutely filthy. 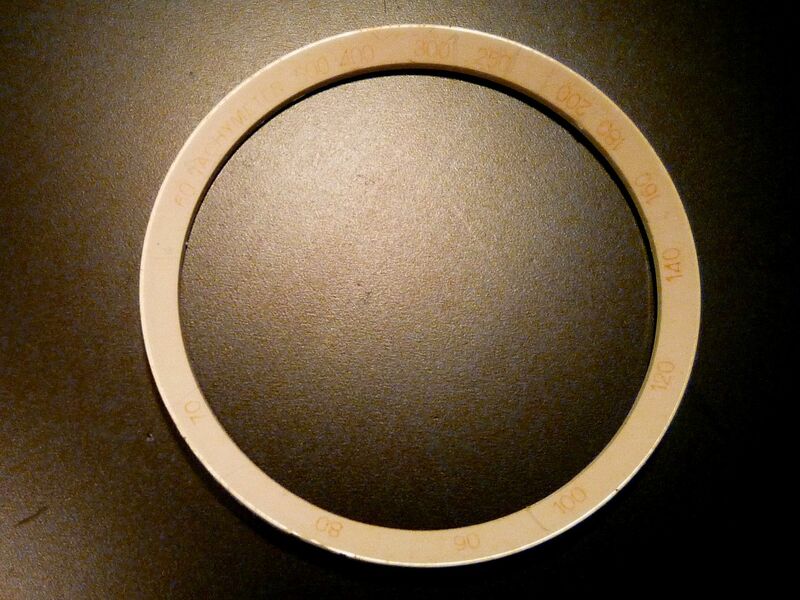 The bracelet was clearly non-original - a 20mm 'generic' that had been filed down to fit the 19mm lug width. 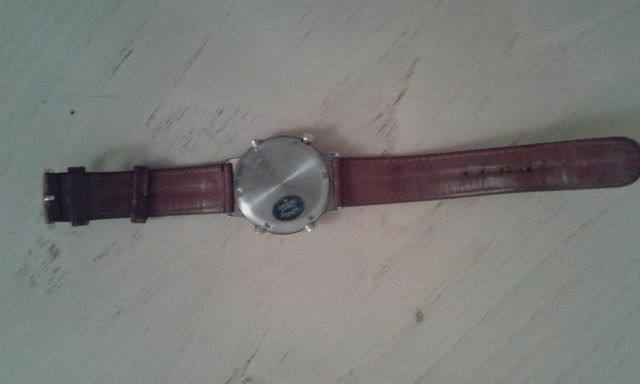 Well, partly filed down - because whoever had fitted it had also 'relieved' the lug areas of the watch to make it fit ! The pushers had obviously been attacked with pliers at some point; the crown was not original and the case tube had been reamed to suit. 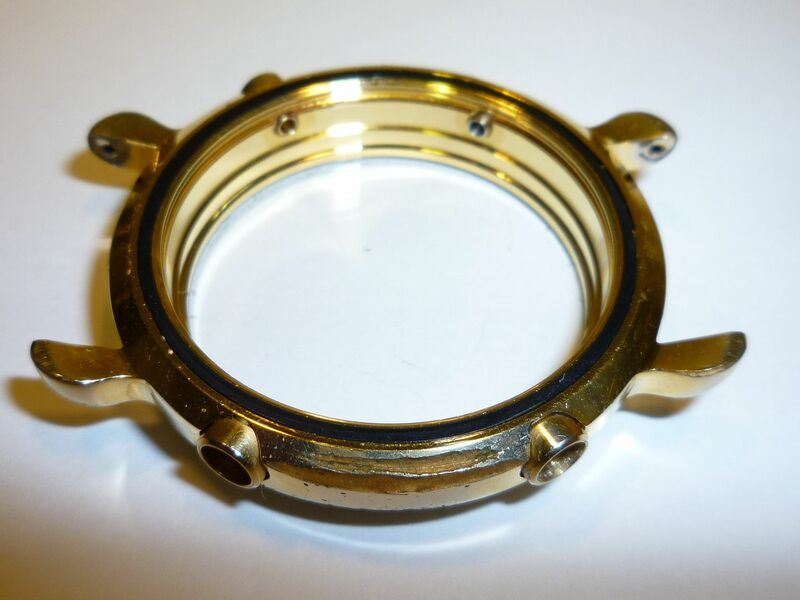 The gold plating was completely worn off the pushers and bezel and the case-back had deep scratches inflicted by clumsy use of a removal tool. The crystal looked quite good, but was clearly a replacement, which like the original had been glued in. 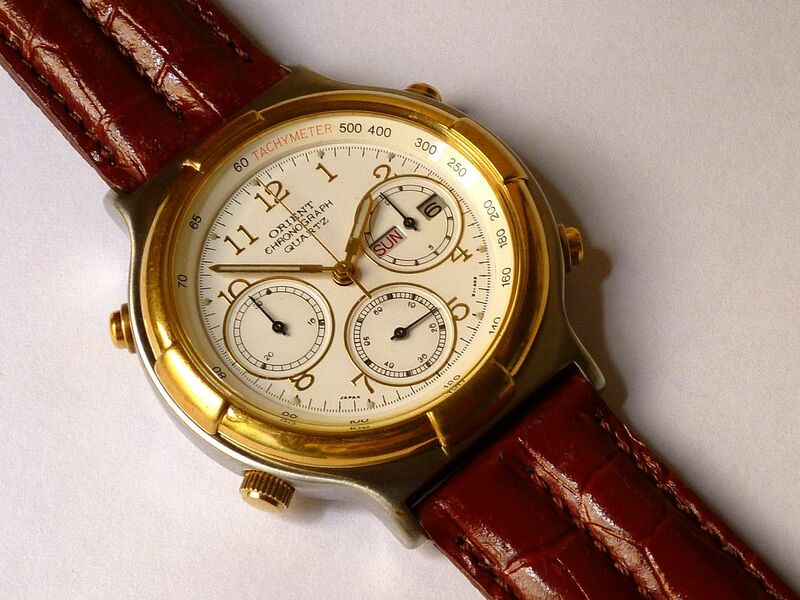 Quite tidily done, but I suspect whoever did it left the plastic Tachymeter ring in the case, because the original red lettering of the Tachy scale was almost completely bleached. 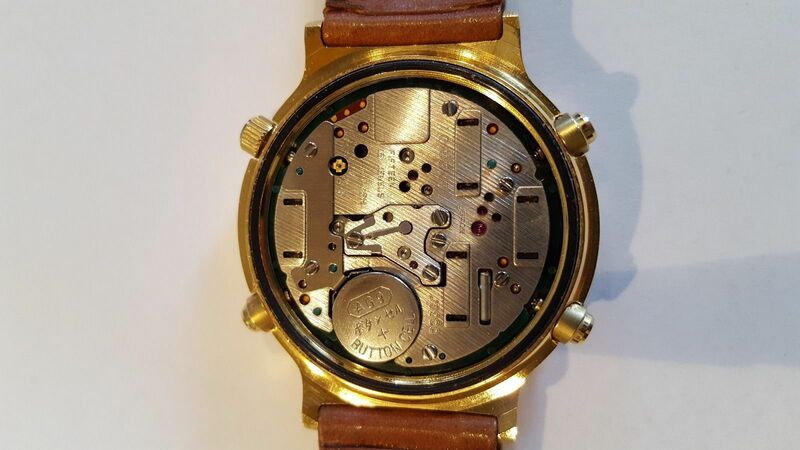 The dial and movement had obviously been subjected to both moisture ingress and acid attack from a leaking old battery. There's an old adage that applies in such situations: Don't throw good money after bad. 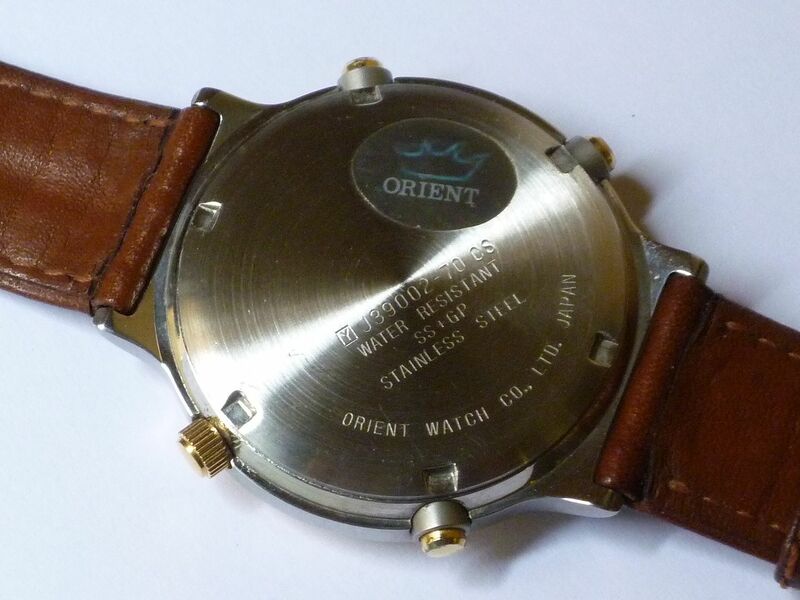 I carried on searching eBay for Orient J39's (and indeed regularly still do) - and particularly another much better J39002-70. In the end I relented and bought one. It had been re-listed many times since March 2013 and eventually the price came down to $55. It was in quite nice original condition and apart from a recalcitrant 1/10 second chrono' stepper motor all worked fine. 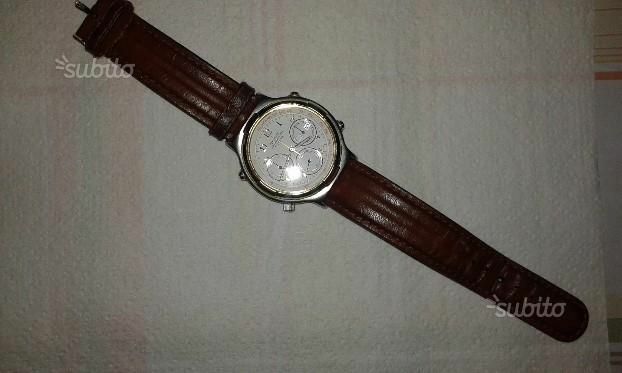 Thing was, although I'd bought it mainly to rob for it of its watch case, it really was too nice a watch to break up for parts. But I had bought it for another reason - to rob it of (most of) its hands to help 'put right' my ex-Tickdong Racer J39908-70. My apologies to readers. I did start this thread off with the best of intentions - and then completely forgot to add any updates. I did indeed rob that J38911-70 of most of its hands (other than the date pointer) to rectify my ex-Tickdong Racer J39908-70. 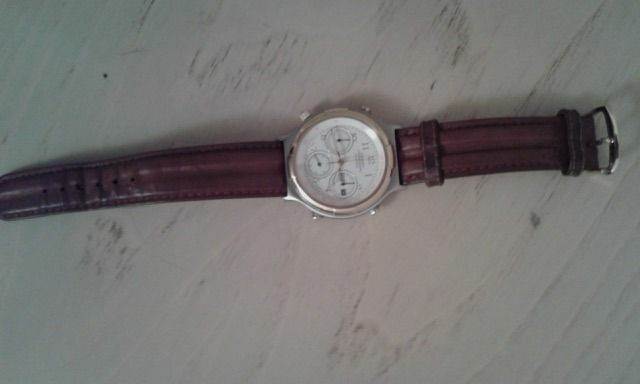 Into which I subsequently installed the 'job lot beater' J39002-70's dial / movement and Tachymeter ring. I should explain the apparent slightly odd colour of my hand in the first wrist shot. I wasn't suffering from extremely high blood pressure. Normally I take a few shots, in quick succession, and pick the best one to post in the WRUW thread. Sometimes, if 'my best' isn't good enough, I'll occasionally lighten them - adjusting the brightness and contrast by up to 10%. The 'best one' really was still pretty bad, even after that tweak. So in an effort to bring out the almost completely faded Tachymeter ring lettering, I played around with the colour balance - increasing the red. Photoshop is definitely best left to experts. Before any eagle-eyed reader points it out, there was one small oversight I made in re-housing it in a J38911-70 '7A48' case. The pusher cups are silver anodized, whereas the J38911-70's were gold anodized - a slight anomoly I'd observed in other J38's. Regardless - I thought it was a step in the right direction. I'd replaced that strap with a rather nice (but non-original) 19mm dark green 'mock croc' double ribbed strap, so this became 'surplus'. 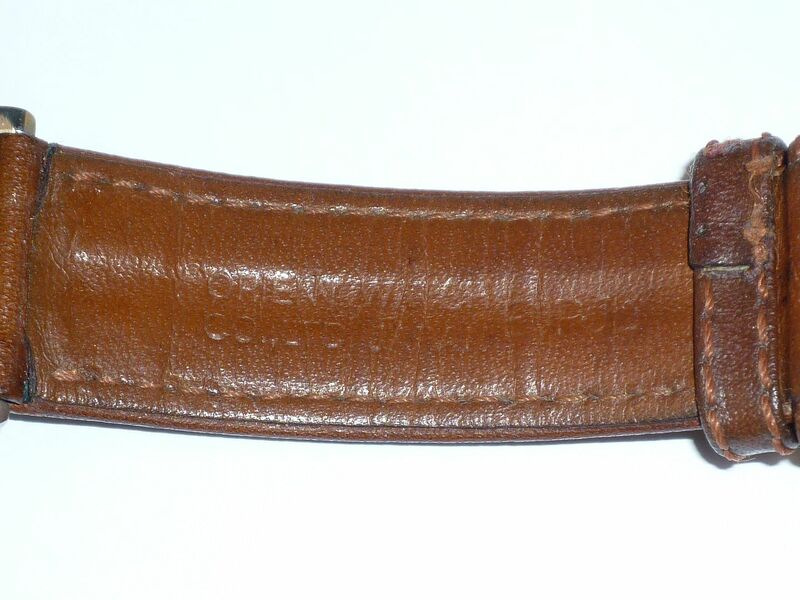 Problem was, that although it fitted the (same) 19mm lug width of the J39002-70 / J38911-70 case and 'sat well', because the lugs of this case are so much shorter than that of a J39908-70, I couldn't line the buckle up on the same hole without 'strangling' my wrist. Perhaps that's another reason why my hand looks a bit 'flushed' in that first photo. Moving it to the next hole left it feeling sloppy. 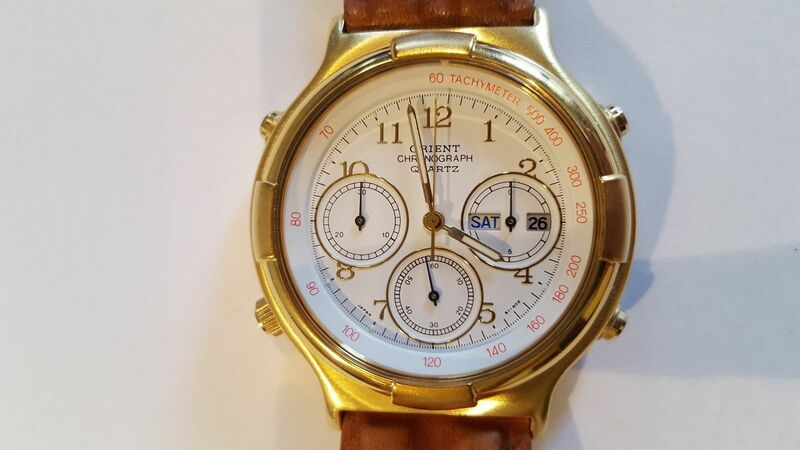 which I remain extremely nervous of trying to clean, my biggest frustration was the badly faded condition of the Tachymeter lettering. 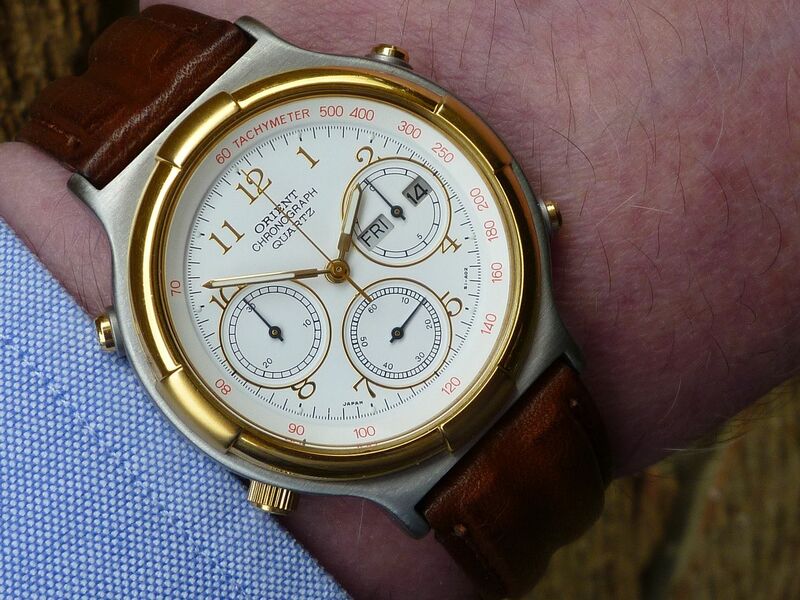 Back in March, while Calum was still making progress with his 7A28 dial re-finishing project, I did think about asking him if he might be interested in attempting to create a graphic and tampo print the J39's Tachymeter ring for me. As that seemed to have stalled, I later thought about attempting to re-do it in Letraset. Unfortunately they don't do Red numbers that small. But I found a solution eventually. Remember this bit from above ? There didn't seem to be much interest and the seller subsequently reduced the Buy-it-Now price. I gave into temptation and bought it. 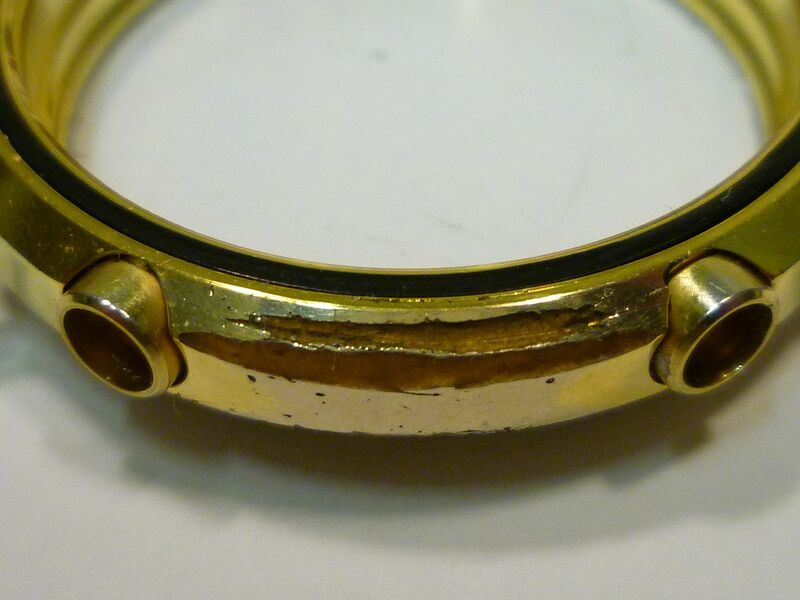 Annoyingly, as it certainly wasn't obvious in the seller's listing photos, the watch case I'd primarily bought it for had suffered very badly from sweat-induced corrosion, right through the outer metal skin to the resin underneath - worse than on my 'beater' J39908-70 ! IIRC, Don and I had quite a lengthy exchange of good-humored PM's about this method of watch case construction at the time. Well I suppose I ought to finish off this thread - something of a belated anti-climax. 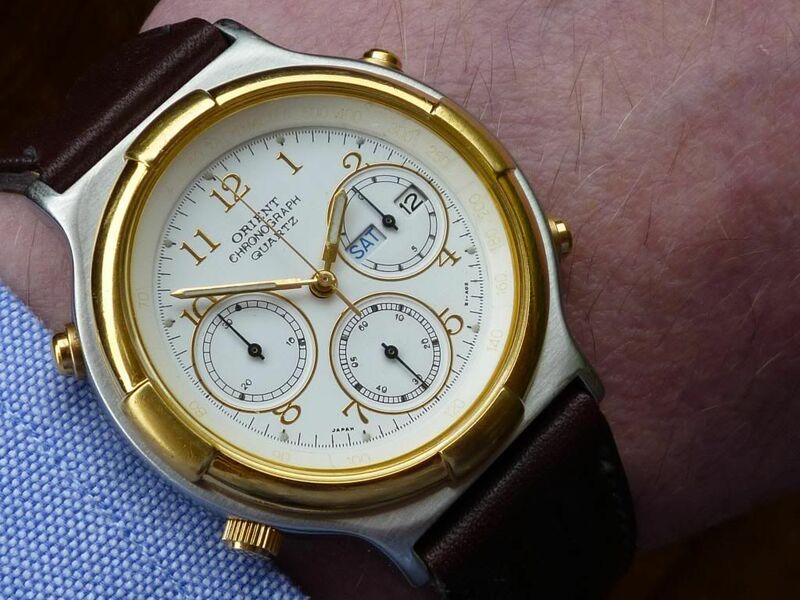 Athough the watch case (above) that I'd bought the most recent Orient J38 as a 'donor' for was next to useless, it wasn't entirely a complete waste of money. 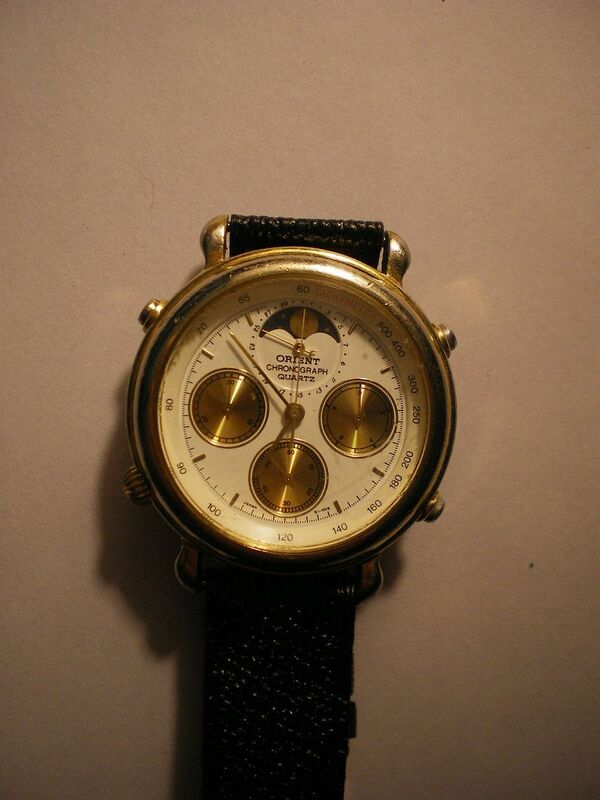 I hadn't even noticed at the time I bought it, but thankfully it also yielded a half-decent Tachymeter ring. 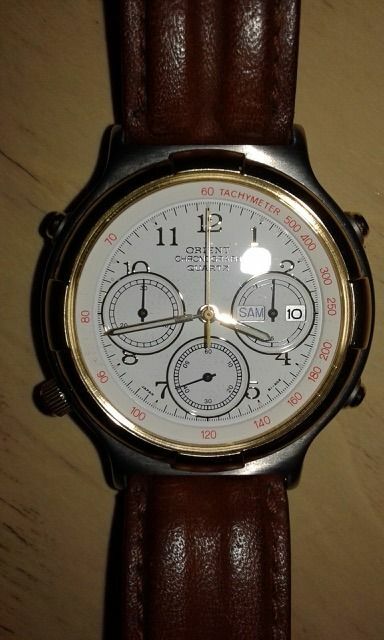 It may not have all red printing as per the original correct part for this watch, but at least the word TACHYMETER was printed in red. 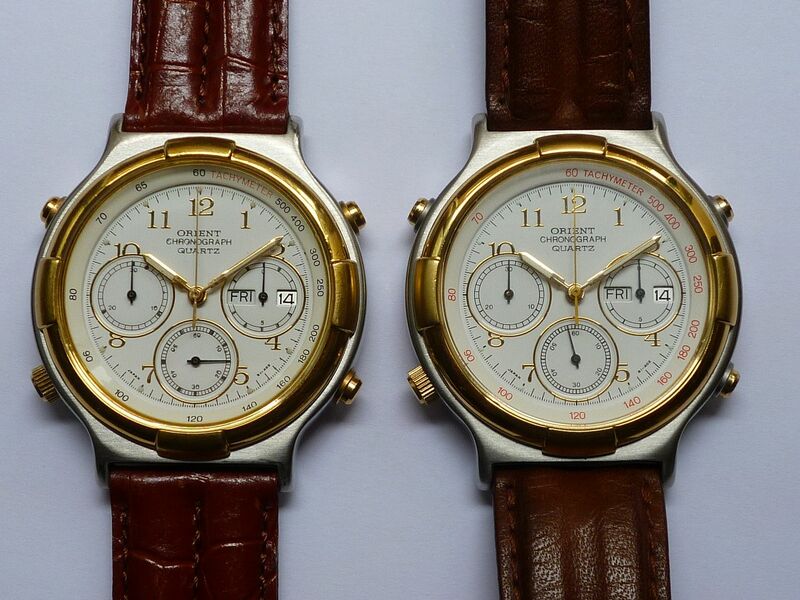 Fortunately the dial rings are interchangeable between these two styles of Orient J38 / J39 case. 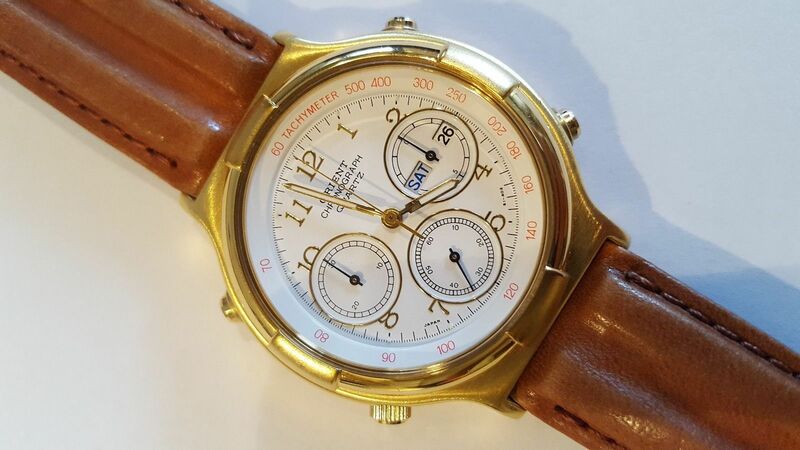 Wrong colour finish pusher housings; wrong Tachymeter ring and that lightly water-damaged dial. 1) Don't throw good money after bad. 2) You can't make a silk purse out of a sow's ear (or in this case 3 sow's ears). 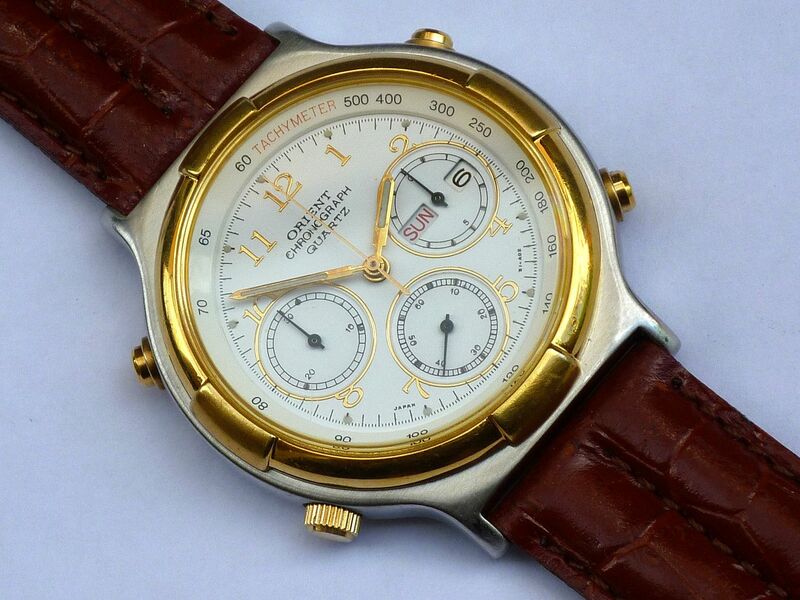 3) Next time I see a correct original Racer / Orient J39002-70 - even if I consider it's over-priced (and I'm over-spent) - Buy it !!! 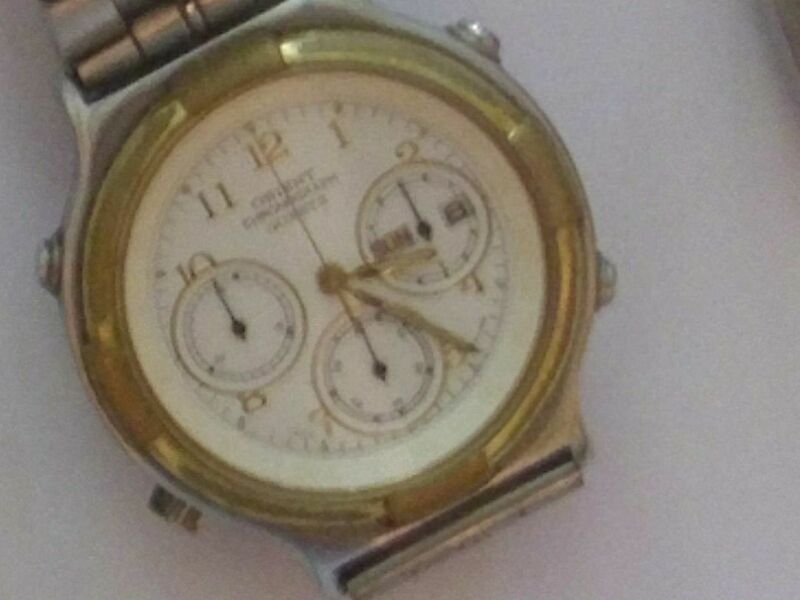 PS - Anybody want to buy a couple of spare Orient J3820 (7A48) movements / dials / case ? Going relatively cheap. But then again, it's also related to the 'resto project' J39002-70 covered in this thread, so here's where it can go. Goes without saying that I've continued searching high and low for another correct original example of the J39002-70 - without any success. Even now, if you google that model number, all that comes up is this thread. Still kicking myself for not buying that Racer branded version on Milanuncios. But I've just bought myself something of a(nother) consolation prize. 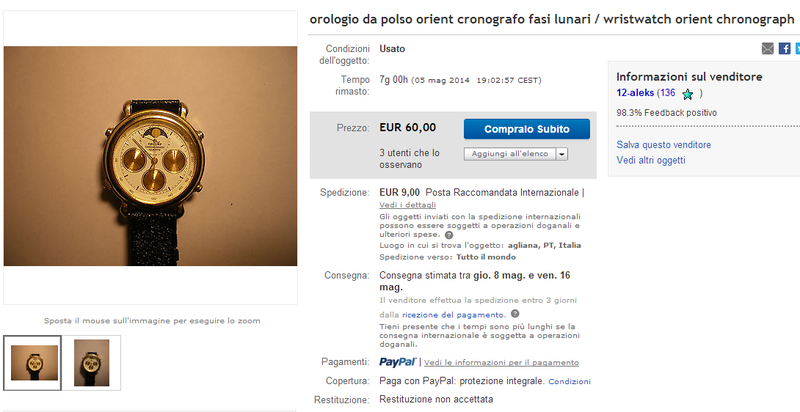 I spotted it listed on eBay Italy over a week ago. Won the auction on Monday. Here's a few of the eBay seller's photos for now. 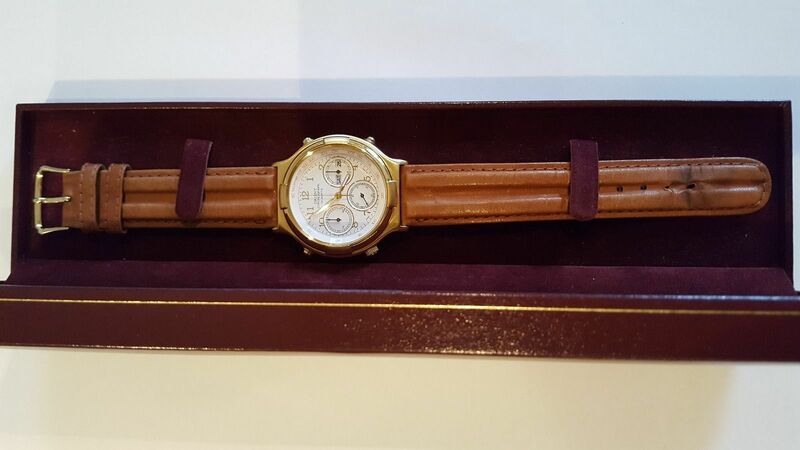 Nice clean dial; almost unworn case; unfaded red Tachymeter ring lettering; original Orient leather strap - and complete with box. All for less than half what I'd spent on building up that J39002-70 'bitza' from the original basket case restoration project. 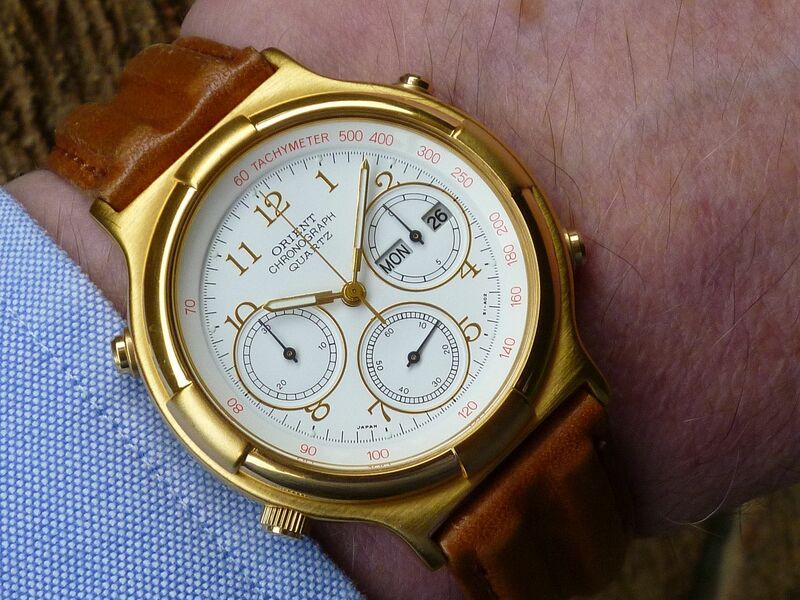 That gold-tone J39902-70 arrived in this morning's post. 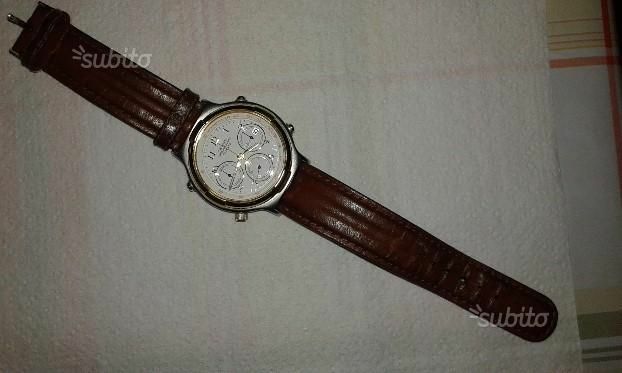 If anything, it's in better condtion than indicated by the seller's photos. At some point, I'll take a side-by-side photo with my two-tone 'bitza' J39002-70, though the comparison won't be very favourable. 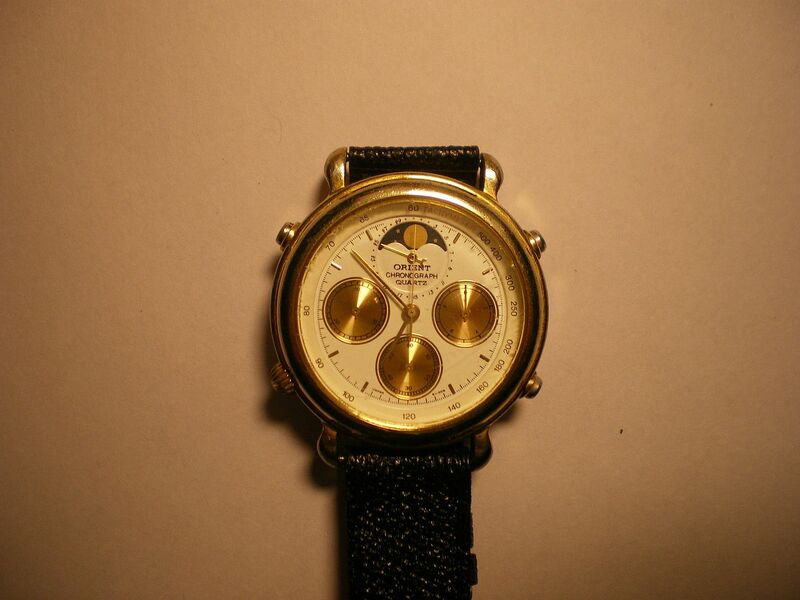 For now, here's a wrist shot of the J39902-70, as received - slightly different to the two I just posted in the WRUW thread. Athough I'd managed to (re)construct that 'bitza' two-tone J39002-70 a couple of years ago, I still wasn't entirely happy with it. 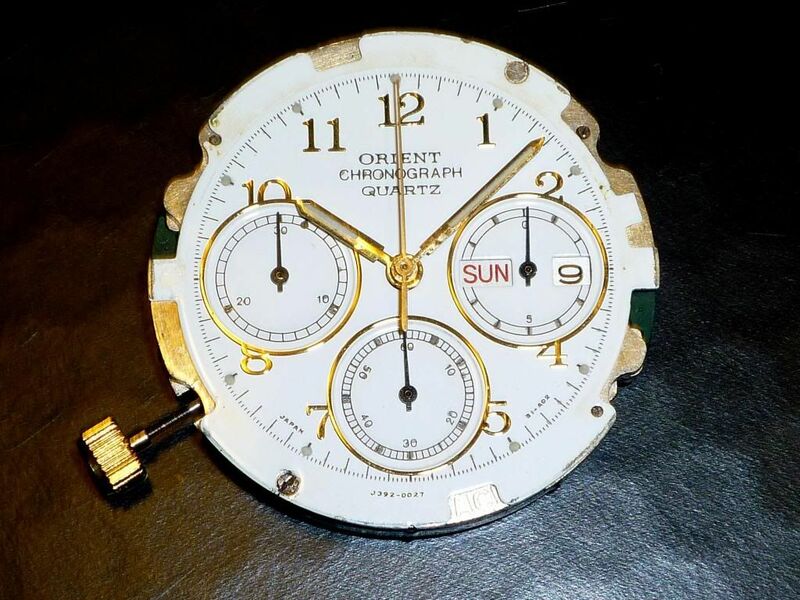 It wasn't so much the anomolies of the incorrect colours of pusher housing and Tachymeter number printing, which I could live with, but the poor condition of the water-damaged sub-dials that really let it down. So I've kept on looking for another better original example. 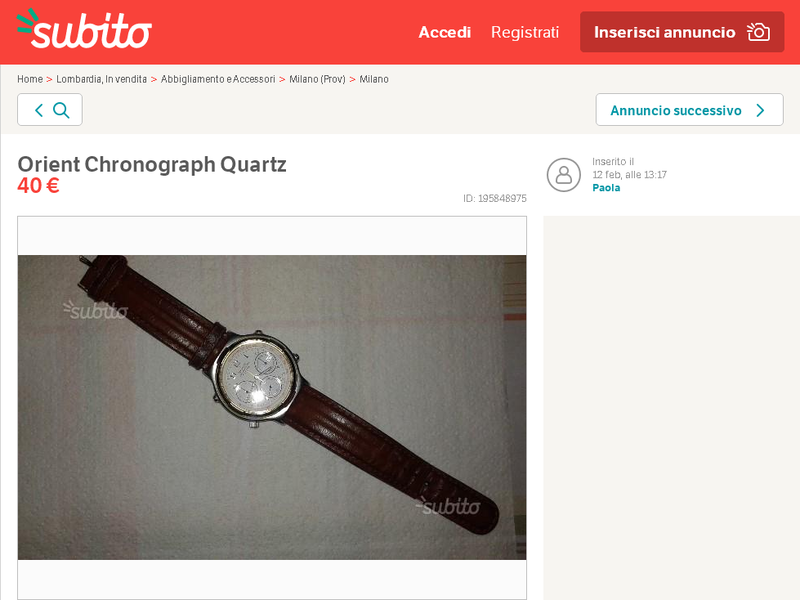 I finally found one on the Italian free classifieds site Subito.it. But it clearly had possibilities. I forwarded the link to Michele of Segnatempo, who'd helped me with another recent J39 purchase. Before I had a chance to email the Subito.it seller, myself, to ask for some better photos, Michele had already beaten me to it ! The first one was all I really needed to see. Michele didn't hang around either - and has also purchased it on my behalf. 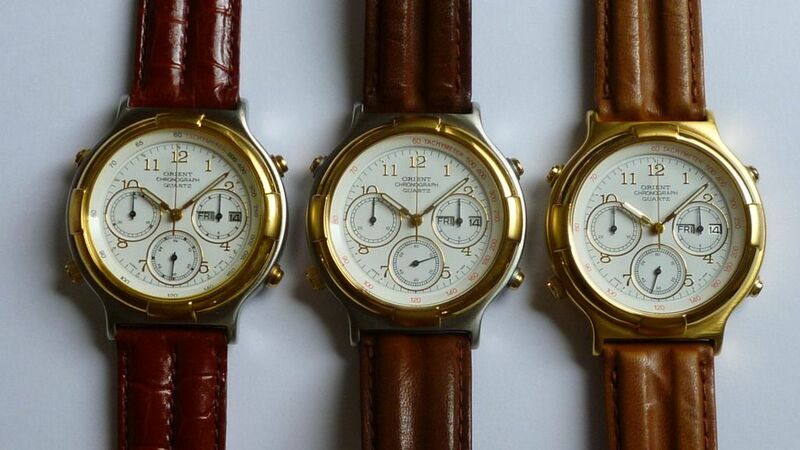 Michele's package containing my trio of recently acquired Orient J39's arrivered on Monday. Although it was the cheapest of the three, I was initially most pleased with the J39002-70 - in relative terms of price paid and received cosmetic condition. 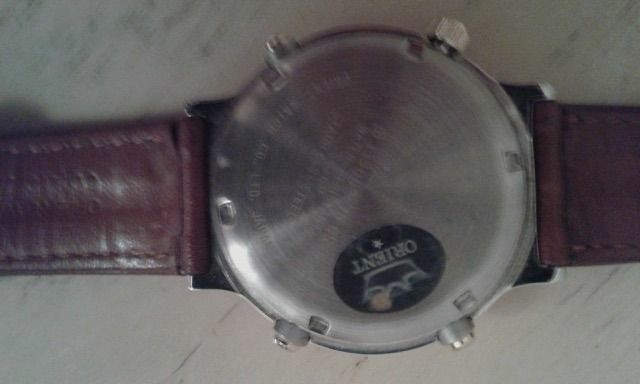 Externally, at least, it appeared to be well cared for, still fitted with the original leather strap and Orient hologram sticker on the case-back. When I unpacked it, it wasn't running; still showing the same time as in the seller's photos - so naturally I assumed a flat battery. I unscrewed the case-back to find there was no battery fitted. From the residual deposits, it had clearly suffered from a battery leak, most evidence of which had been cleaned up. The ears on the battery positive plate were corroded. I cleaned them up, carefully scraping away the sulphate deposits and gingerly fitted a new battery. 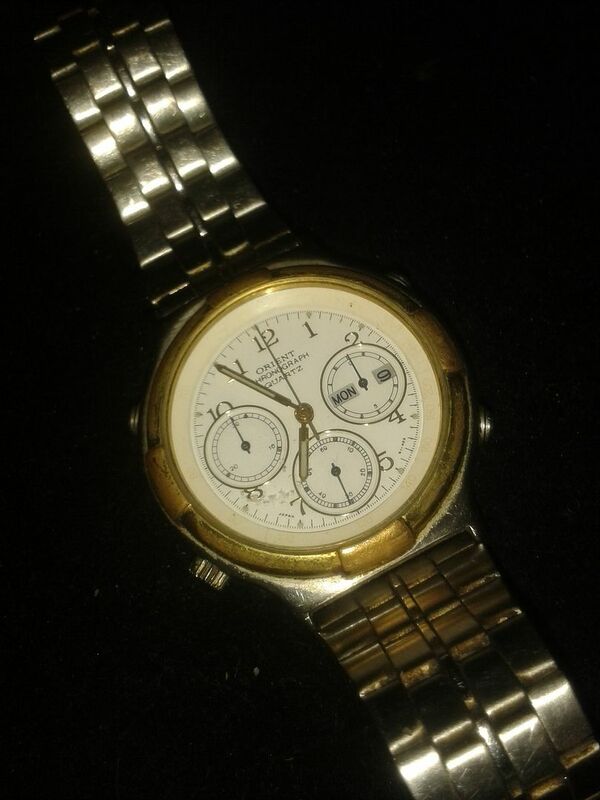 Everything worked, straight away, apart from the chronograph sweep second hand, which didn't even so much as twitch. Took the back-plate off and swapped the dead coil this morning. 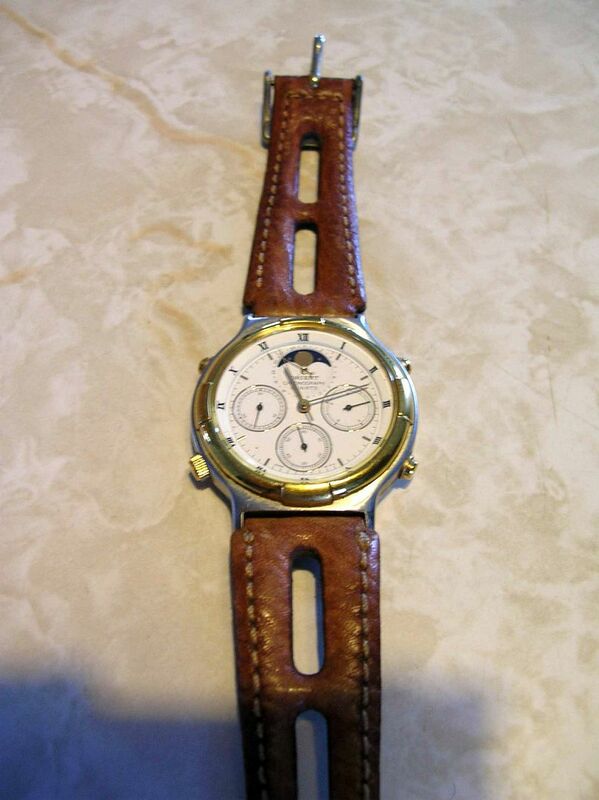 Here's a slightly different wrist shot to the one I posted in the WRUW thread a little while ago. 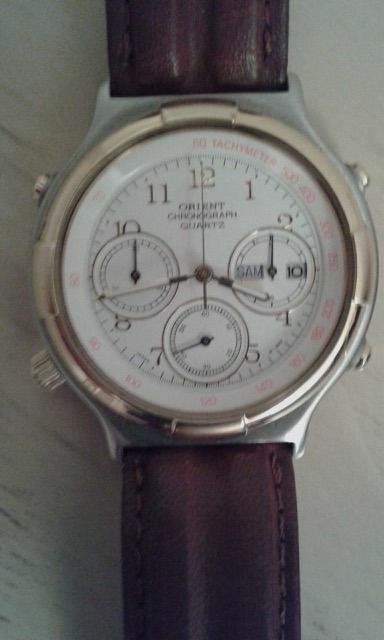 Now I've finally managed to obtain a far better original example of the two-tone Orient J39002-70, it would probably be more appropriate to take a photo of that next to my 'bitza'. So that's what I did this morning, although the available light wasn't the best. Now all I need is the RACER branded version I missed buying back in August 2013. Patience is a virtue (if not one of mine).